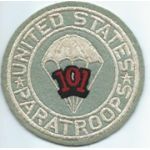 WWII 101st Airborne Division White Tongue Variant Patch. Machine embrioidered. Unused. 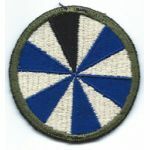 Pre-WWII 106th Infantry Regiment Pocket Patch. Light blue wool background with heavy chenille / chain stitched details. Has been used. WWII 108th Ghost / Phantom Division Patch. Fully machine embroidered. Unused. 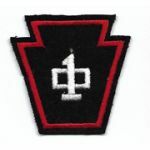 WWII 10th Regiment Pennsylvania State Guard Patch. Machine embroidered on felt with a cheesecloth like backing. Unused. WWII 119th Ghost / Phantom Division Patch. Fully machine embroidered. Unused. WWII 11th Ghost / Phantom Division Patch. Fully machine embroidered. Unused. 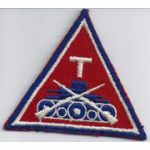 WWII 125th Infantry Tank Company Patch. Machine embroidered on twill, with a cheesecloth like backing. Unused. Tough patch to find. 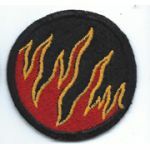 WWII 12th Corps OD Bordered Greenback Patch. Fully machine embroidered. Used. Hard to find patch. WWII 135th Airborne GHOST / PHATOM Division Patch. Two piece. Fully embroidered. Unused. 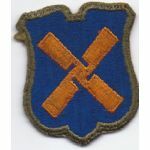 WWII 13th Airborne Division Patch. One piece. Fully machine embroidered. Unused. 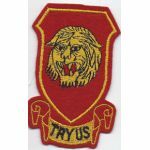 WWII 141st Field Artillery Battalion Patch. Machine embroidered on felt with a cheesecloth like backing. Unused.